We need to lobby the Ministers at a Federal level first (Banksia Road) and then at a State level (for both sites), continually emailing and raising our objections. All details regarding the Banksia Road Sand Mines and the proposed clearance of the Banksia Woodlands Conservation are to be updated and found on this page. Fortunately a single resident noticed the Public Notice in the newspaper (27th July), which sparked the campaign as you see it now. 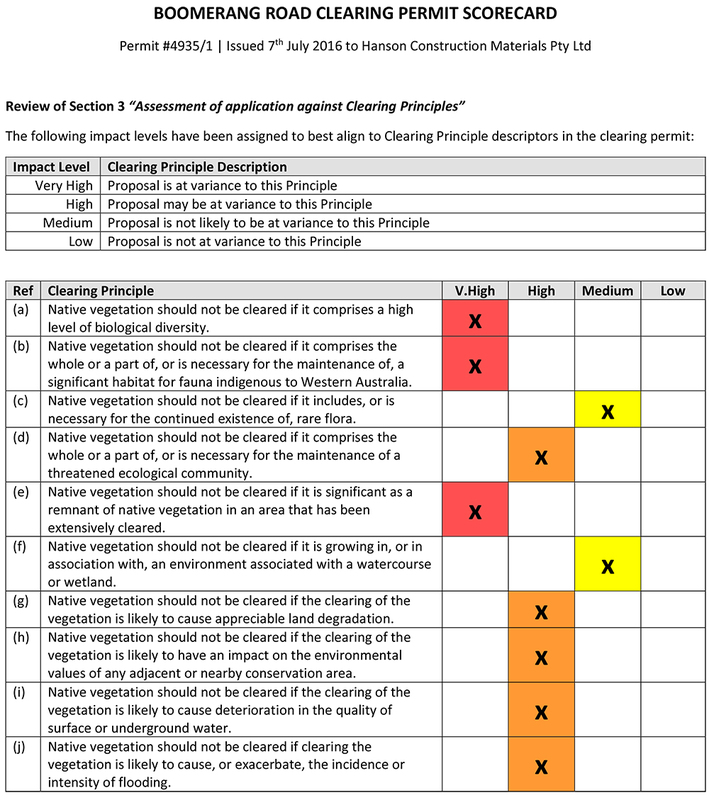 Hansons Australia (formerly Rocla Pty Ltd) are proposing to clear pristine vegetation in order to mine a small supply of concrete sand for the construction industry. From the PGV Environment Report, “the reserves at Wellard will ensure an affordable supply of concrete sand to Perth for approximately an additional 12 years. The project will supply additional resource of concrete sand to the Metropolitan area at a relatively low cost”. That doesn’t sound so bad? Unfortunately, it’s another case of PROFITS before PEOPLE. 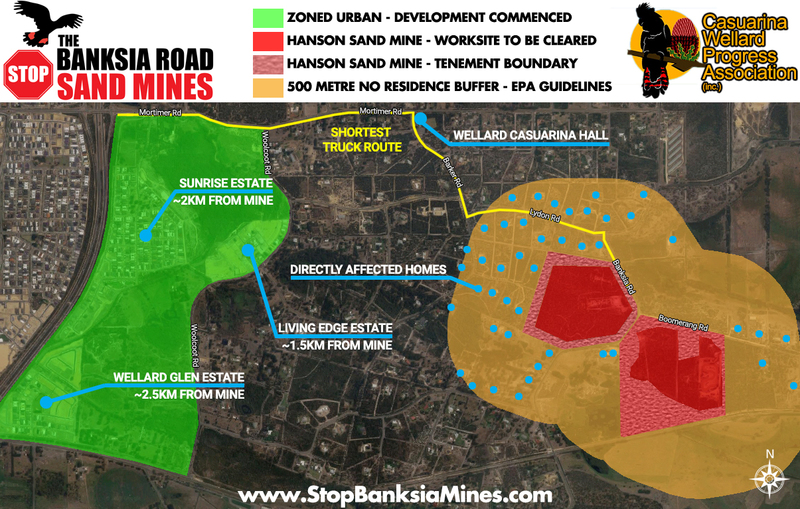 Bare in mind the City of Kwinana stand beside local residents, against the mine, the City was not informed of this most recent proposal and no local residents were consulted. In 2016 the Threatened Species Scientific Committee approved Conservation Advice for the Banksia Woodlands of the Swan Coastal Plain ecological community. The woodlands are listed as Endangered under the EPBC Act. The woodlands at the Banksia Road site are managed by the City of Kwinana as a Conservation Reserve. This Conservation Reserve is home to many vulnerable species of flora & fauna including black cockatoos and other marsupials. Clearing this land will mean a loss in a pivotal area necessary for the protection of many of these species as well as traffic hazards caused by the displacement of these animals. The Conservation Reserve providing an ecological linkage was one of the very basis that allowed the Boomerang Road site to be approved! Local ecological linkages will be severely fragmented as up to 27.6 ha (68.6 Acres) is proposed to be cleared. 16.25 ha (40.15 Acres) at the Banksia Road site. 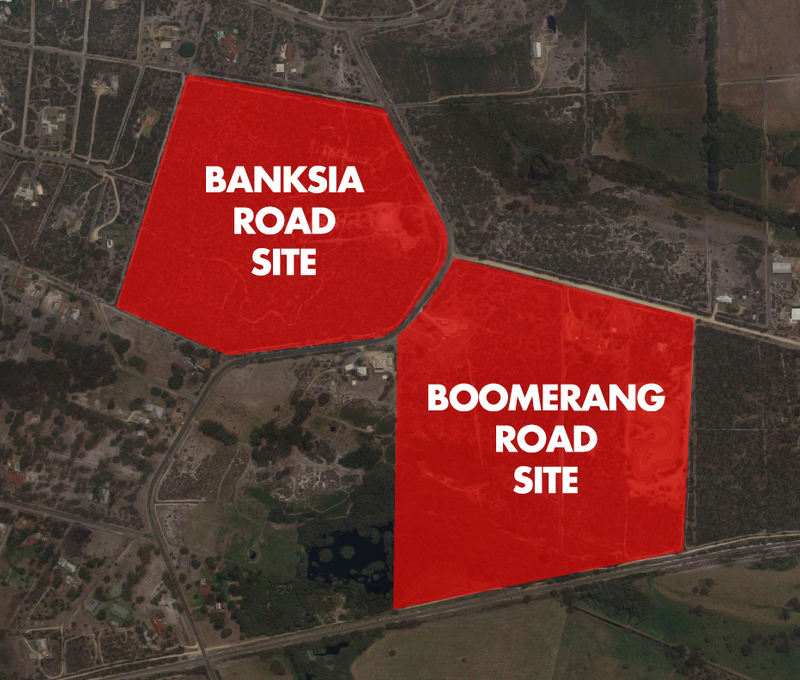 11.6 ha (28.66 Acres) at the Boomerang Road site. It is not possible to properly rehabilitate the Banksia Woodlands. Why destroy a Conservation Reserve that is already Pristine and known to be in decline? The destruction of high quality Banksia Woodland is unrecoverable in the short-to-medium term – our lifetime. The decline of endangered species is based on the current lack of habitat, in turn reinforcing the need to retain habitat for threatened species now. Environmental Offsets proposed have been proven to not be working. 60 MILLION Litres of water is expected to be drawn from the water table to support mining operations at the Banksia Road site only. Banksias have shallow roots and therefore surrounding woodland will consequently die. The Boomerang Road site proposals make no mentions of water usage however it is known a water permit will be sought, based on the worksite area an additional 40 Million Litres is expected to be drawn, cumulatively up to 100 Million Litres for both sites if operating together! Increased risk of spreading the small and localised amount of die-back at this site through mining operations and site disturbance. Considerable crystalline silica dust implications (the new asbestos) causing major health implications to surrounding rural and housing estate residents. Dormant lead contamination of top soil that if disturbed will cause contamination of the air and ground water with major health implications. Easterly breeze will significantly affect the rural residents and estate developments which are still in their infancy (significant estate development expected in coming years). Surrounding rural residents are not on ‘town’ supplied water, all water is supplied from a tank with housing or shed roofs used for catchment. Settling toxic dust would contaminate primary water sources. Personal respiratory equipment and dust-proof machinery cabins required for mine site staff, but not for the neighbour next door. Local residents will be repeatedly exposed to this toxic dust, according to Hansons own Safety Datasheet: Repeated exposure to the dust may result in increased nasal and respiratory secretions and coughing. Inflammation of lining tissue of the respiratory system may follow… caries risk of causing serious and irreversible lung disease, including bronchitis, and silicosis (scaring of the lung) + many more. Chemical additives are proposed to be used for dust suppression, significant protection equipment and safety procedural requirements but not for the neighbour next door. Increase in trucks using roads not designed for large scale heavy haulage will put community’s safety at risk. Increase in road traffic ‘Black Spots’ due to poor sighting and unfavourable road gradients or contours. The shortest route for trucks from the Sand Mine to the Freeway is Banksia Rd, Lydon Rd, Barker Rd, Mortimer Rd, as detailed in the image below. The path of least resistance is only natural. Noise pollution from sand mining machinery and equipment that is not suitable or welcome for the area. The value of properties in the area will decline greatly as a result of environmental impacts of this mine, which far outweighs the short‑term value of the mine. Unfortunately, we fight this approval battle against the Banksia Rd site, where across the road into the Shire of Serpentine-Jarrahdale a mining lease has also been granted for the Boomerang Rd site which has received full approval, however for issues unknown has not turned one bit of sand and has not cleared vegetation. Both sites are completely inappropriate given the proximity to nearby estate developments and rural subdivisions that have occured under City of Kwinana Town Planning since the original application in 1995. In 1995 this may have been approved (only a few residents existed), however it wasn’t granted back then, now in 2018 it is incomprehensible how this could have received EPA and former State Government approval. Norman Moore approved the mining lease before retirement in 2013, he was never intending to face the implications of his decision and hand-balled it to the current Government. The CWPA led by Steve Sturgeon fought against the initial Boomerang Rd site in 2014. Whilst the City of Kwinana has maintained strong objections at the Banksia Rd site, the Shire of Serpentine-Jarrahdale approved operations at the Boomerang Rd site next door. The PGV Environmental Report (PDF) states Hanson are “currently mining a site closer to the wetland to the south-east known as the Boomerang Road Site”. This statement is used to justify the mining of additional adjacent Banksia Woodlands and is blatantly untrue! No mining work has been undertaken, In fact no preparation to commence mining is visible. The environmental and social effects of mining Boomerang Road have not yet been realised and therefore justifying a new site based on an existing site is a misleading and deceiving tactic. 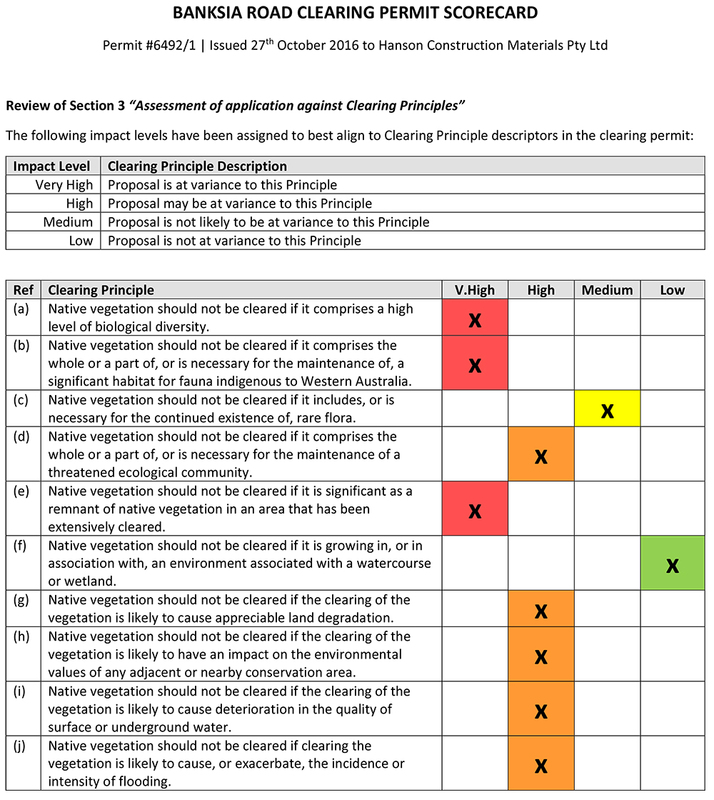 According to EPA Guidance for the Assessment of Environmental Factors, buffer distances are required to separate industrial land use and sensitive land use to minimise health, safety and environmental impacts, considering typical emissions that may affect the amenity of nearby sensitive land uses (gaseous and particulate emissions, noise, dust, odour). 500 metre buffer required for screening works (screening or sieving of sand, rocks, chemicals and minerals) due to noise and dust impacts. 300-500 metre buffer for sand and limestone extraction (no grinding or milling works) due to noise and dust impacts. The buffer zone is inadequate considering minute dust particles can travel for kilometres and particle density will vary significantly dependent upon weather conditions and distance from the mine.